Fortnum & Mason Food & Drink Awards 2015 | Highly Commended Curing and smoking your own food is a bit of a lost art in Britain these days. While our European neighbours have continued to use these methods on their meat, fish and cheese for centuries, we seem to have lost the habit. But with the right guidance, anyone can preserve fresh produce, whether living on a country farm or in an urban flat - it doesn't have to take up a huge amount of space. The River Cottage ethos is all about knowing the whole story behind what you put on the table; and as Steven Lamb explains in this thorough, accessible guide, it's easy to take good-quality ingredients and turn them into something sensational. 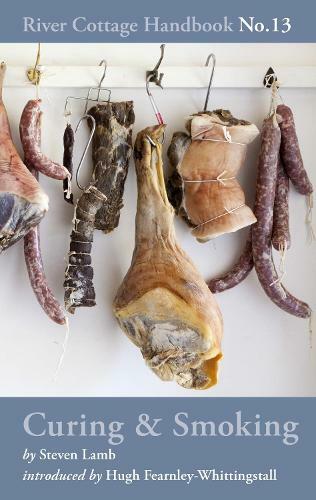 Curing & Smoking begins with a detailed breakdown of any kit you might need (from sharp knives to sausage stuffers, for the gadget-loving cook) and an explanation of the preservation process - this includes a section showing which products and cuts are most suitable for different methods of curing and smoking. The second part of the book is organised by preservation method, with an introduction to each one, and comprehensive guidance on how to do it. And for each method, there are, of course, many delicious recipes! These include chorizo Scotch eggs, salt beef, hot smoked mackerel, home-made gravadlax ... and your own dry-cured streaky bacon sizzling in the breakfast frying-pan. With an introduction by Hugh Fearnley-Whittingstall and full-colour photographs as well as illustrations, this book is the go-to guide for anyone who wants to smoke, brine or air-dry their way to a happier kitchen.